asos future stylist 2012: clash of the prints. Hello everyone! Here's my second outfit for Asos Future Stylist 2012, and I have to say that this look was even more challenging than the first! I'm never usually one to wear prints, let alone clashing prints, but as always it was so darn fun to experiment with a look so different to my own personal style. As soon as I spotted the Whistles blouse I instantly wanted to base my whole outfit around polka dots, so thought the spotty heels would make the perfect accompaniment, along with teaming them with these pretty cropped floral trousers. I really feel that I have fully embraced the 'clash of the prints theme' and have extremely stepped out of my comfort zone to create an interesting look, and for that I would just love your votes! It would be just lovely if you could vote for me daily, it would mean so much to me to go through to the next round! Also, like last time, Asos have kindly offered the chance for one of you to win a £25 voucher, so all you have to do to be entered is to vote for me here and comment on this post leaving your email address! I'll announce the winner next week. Love, Jazzabelle. I vote every day religiously and have pinned this to Pinterest, plus I'm your biggest stalker PICK ME! Very different to all the others i have seen! God. How. Bloody. Brilliant! Love the clashing patterns, especially the shoes! I have that very ring (of an M though!)ASOS?. I love that you have fully captured what the trend is about and loved that you mixed your prints so well. Voting for you daily and I honestly hope that you get through to round 3. This outfit is so lovely, it's such a good look for you! I totally know what you mean though, I would find it so hard to clash prints without looking like a crazy person, but you look amazing! Love the clashing prints it really suits you! Wow! This is by far the best look for this round! You look amazing!!! This is my favorite outfit out of all the other 'clash of the print' outfits the other bloggers have done. You look great and those shoes are to die for! Amazing shoes! How tall are you? I'm 5'9 and could never pull that off! hello carolina, i'm just about 5'7! i hope that helps. the heels are so darn lovely and rather comfortable - i adore the dainty ankle strap! you look stunning - you should definitely clash those prints in your outfits more often! adore the heels. Oh wow Jazmine can you look anymore stunning? Those trousers are absolutely amazing! I've voted for you lovely! You look amazing! And I love that bracelet, so nice! Gonna vote now! Love the different patterns in this outfit! I love the blouse. Look perfect with black high waisted shorts. So your style. I voted for you. Gaynor.ohalloran@gmail.com. Good luck with the rest of the competition :). VOTED!! 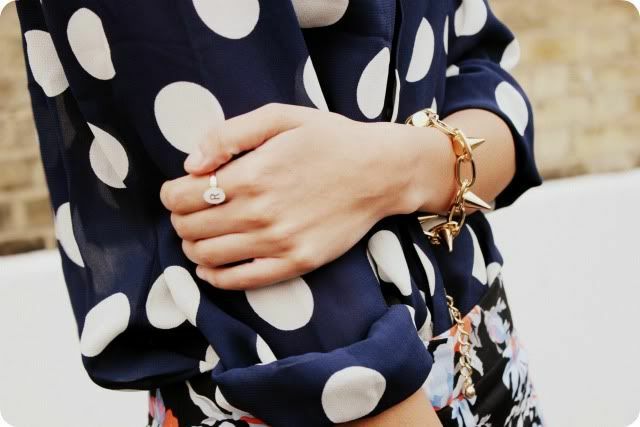 The polka dot blouse is stunning. polka dots and floral - never thought they'd go so well together! I've voted for you a few times now, you've styled the look perfectly! Really hope you go through! your look is definitely the best one! And I´m really in need of your polka dot heels! They are the perfect choice for spring and for every combination which may seem dull at the first glance! This is just brilliant!!! Hope you make it to the next round. how is it that you look so good and en pointe always!? love this clash of the prints. wow, such a lovely outfit! i love the polka dots with the floral trousers combination (: and i voted for you! Outfits amazing!! Love your style! oh my, jaz you look absolutely stunning! love everything about this outfit, so creative! You look amazing! Very bold outfit. I am in love with those shoes. Always vote for you, the look is stunning. Don't think anyone else could pull this off. The clash of the prints works beautifully! Good luck love. Great clash of prints. I love those trousers. I've absolutely loved your looks so far! I love these trousers! I have those trousers already! I've just had a look at the others and I have to say yours is my favourite look again! askjlkesf! i love this so much - those pants look gorgeous on you, and i love the whim of the blouse with those heels <3 you are amazing! Well done for getting to the second round. Voted, of course! <3 And I truly do love this outfit, Jaz! You suit prints oh-so perfectly! You look amazing here, I've been rooting for you all the way through the competition I truly think you deserve it. My vote has been casted and I'll be sure to cast daily! You certainly have my vote...I love this outfit on you. I actually think you've done the impossible and made clashing prints look somehow understated and sophisticated :) My email is theheadlessmannequinblog[at]gmail.com The best of luck in this round!! I really like your style, plus I love the fact that you think more than you buy. You deserve to win! Absolutely love this look on you Jazz, it's my fave ASOS look - you look stunning too! love everything about this outfit! nice clash of prints. Absolutely stunning look, Jaz! For someone who, admittedly, tends to shy away from bold prints, you've done a fantastic job! Keep doing what you're doing - your blog is fab and you've got my vote. love the shirt and would never have thought of putting it with the trousers but they look great together! i really want you to get through just to see what else you'll do! Wow!! Not a lot of people could EVER pull that off but it looks gorgeous on you!!!! AND I LOVE YOUR SHOES!!!!!!! Lol- too many exclamations there but the shoes illicit it :P they're just so cute. I love them. *goes off to look for vaguely similar shoes* (your outfit is reminding me of some awesome spreads in the latest issues of Company if you manage to get a copy have a look...!!! They've got some neat combinations of prints and spring stuff in the their March issue :D)...! Jazz this outfit is perfect! But then you know how much I love a good mixed print! Those trousers are on my wish-list now! georgous again, always wish i could dress like you!! never stop blogging, perfectly styled, dont know how i would put an outfit together without getting ideas off this excellent blog. I always admire those who clash prints and you do it so perfectly! Voting for you was a no-brainer! I LOVE this outfit! I don't know how you manage to match different patterns like these so perfectly! I wish I knew how to, hehe. I'm not just saying this because it's you, Jazmine, but your looks on the ASOS challenge are always my favourites. You put them all together so nicely and I love how you're stepping out of your clothes 'comfort zone' whilst still making them look very you. This look is one of my favourites, you look gorgeous. Lovely outfit combo, you look great!